Pokémon Battle Trozei (the second Trozei title, also known as Pokémon Link: Battle! in Europe) is, at its most basic, a match-three puzzle game in the same family as Puzzle & Dragons– except, instead of orbs, players match up different kinds of Pokémon. On the surface, the game doesn’t seem like it would be that exciting for those who aren’t diehard Pokémon fans. After all, the market is flooded with matching games, many of which you can play for free. So, does Pokémon Battle Trozei stand out enough to justify a purchase? Read on to find out! The player’s goal in Trozei is pretty straightforward: go out into the wild, and catch as many Pokémon as you can (the word “catch” is synonymous with “trozei” in-game.) You have a Pokédex to fill, and a map to explore, and your ultimate goal is to catch ’em all. Sound familiar? Trozei borrows a lot of game mechanics from the Pokémon canon, making it more than a cut-and-dry matching game. Pokémon are spread throughout the different zones covering the map, which are further broken up into different levels. 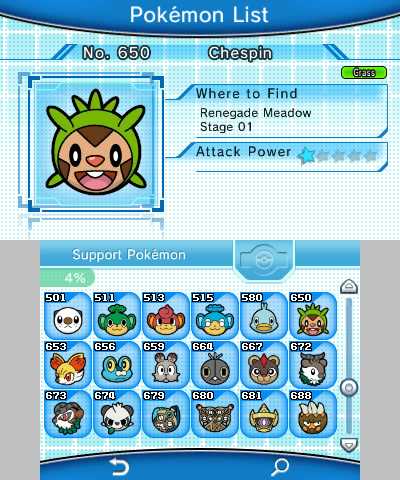 Each level is full of several different Pokémon that you have to battle in order to successfully catch. 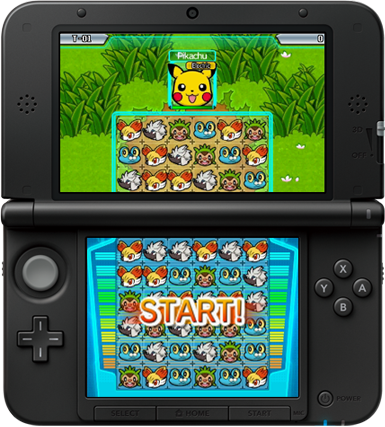 Each battle starts off with a wild Pokémon at the top of the screen and the matching portion below. The playing field, known as a Trozei Box, is full of Pokémon that essentially function as your team. Matching three or more Pokémon launches an attack at your opponent. Type weaknesses and strengths come into play here, giving you an advantage or crippling your attacks if you aren’t savvy with your matches. For example, matching three or more Bulbasaur will launch a Grass-type attack. If your opponent is weak to that type, then your attack will do more damage. Following that initial match with a combo will up the points you get and the damage done to your opponent. All Pokémon who are dual-type in the mainline games are associated with one type in Trozei, which can take some getting used to for avid Pokémon players. One of the most enjoyable things about Trozei is the freedom the game gives you when making matches. The Pokémon you switch can come from anywhere on the screen. They don’t need to be adjacent to one another, and you can move a Pokémon to another part of the screen without that being a part of a match. You don’t have to wait for one match to register before starting on the next one either. These restrictions are often put into puzzle games to increase the difficulty, but Trozei benefits from not limiting players’ movements. Through its other mechanics, Trozei ups the difficulty without severely limiting what a player can do. 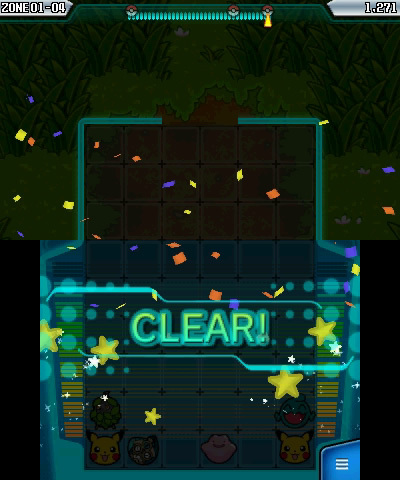 Bringing the Pokémon’s HP to zero means you catch it, and then- congrats! That Pokémon is yours, and you move on to the next area. Wild Pokémon can attack you in turn, though, and, if your energy is depleted to zero, it’s Game Over. 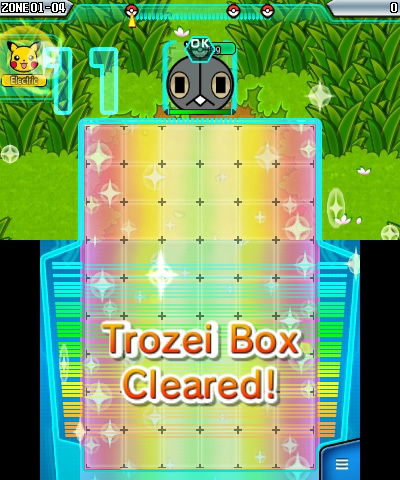 On top of doing damage to your energy level, wild Pokémon can also break the walls of the Trozei Box and drop down inside of it, attacking from within. This makes gameplay a lot more difficult, particularly since some Pokémon are larger than others, and can take up more than half the playing field. To add to the difficulty, you won’t always be facing just one Pokémon bent on depleting your health and invading your personal space. Sometimes, you’ll be up against several wild Pokémon at once. 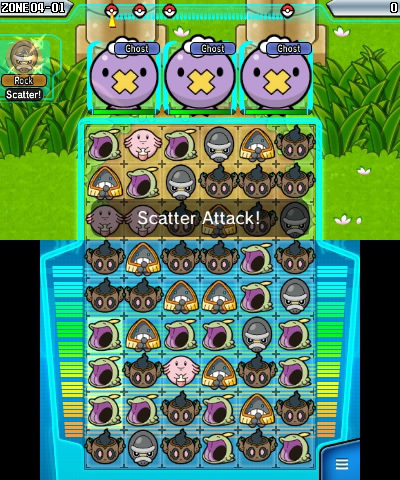 Thankfully, players can make a match of five or more in order to launch a scatter attack, hitting multiple enemies at the same time. Arguably the most stressful (and fun) portion of the game is the Trozei Chance. 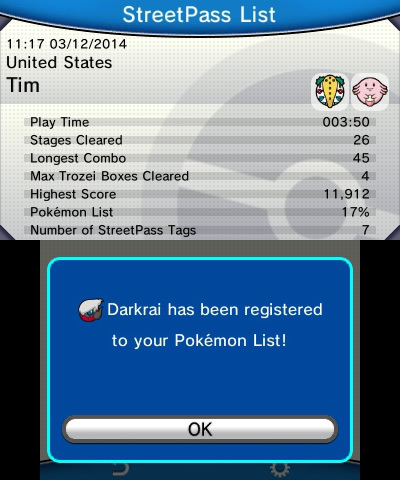 Initiated during a combo, a Trozei Chance allows players to make matches using only two Pokémon instead of three. New Pokémon will stop repopulating the playing field during this time, and, if you clear the entire Trozei Box, you can resume normal gameplay and continue your combo for an even bigger payoff. To spice things up, the occasional Ditto will appear during a Trozei Chance. 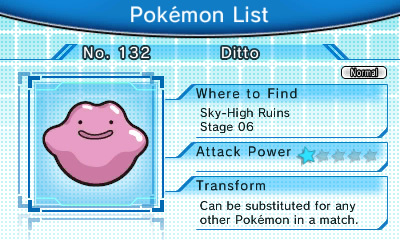 True to its nature, Ditto can be matched with any other kind of Pokémon. This helps you from backing yourself into a corner, but can also prevent you from clearing the box if they appear at an inopportune time and place. Ditto isn’t the only Pokémon with a special ability. 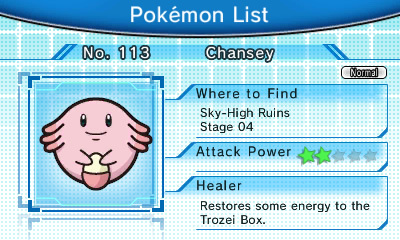 Others can recover your energy, repair the broken walls around the Trozei Box, or give you other advantages. While you sometimes have to depend on the luck of the draw to get these Pokémon on your team, you can also bring them into battle yourself as a support Pokémon. Support Pokémon can be chosen from all of the ones you have successfully caught. This lends some strategy to the game, allowing you to play on type advantages and the abilities of your collected Pokémon. Up to three supports can be chosen once you’ve cleared the game, but you start off with one open slot. Using one Pokémon frequently will make it friendly towards you (a mechanic borrowed from Pokémon X and Y), which means they do more damage on the playing field. 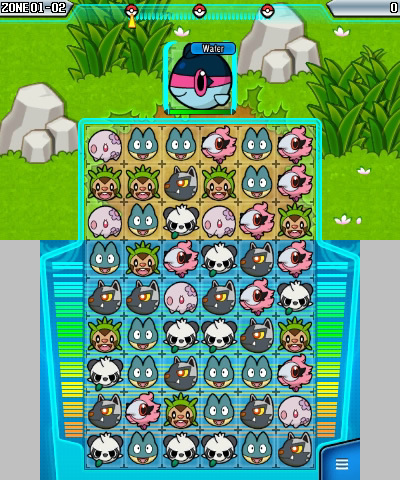 Unlike some match-three games that never seem to end, Pokémon Battle Trozei does only have so many zones available to play. However, this doesn’t limit the game like you might expect. Once the initial zones are finished, there’s still plenty of replay value. 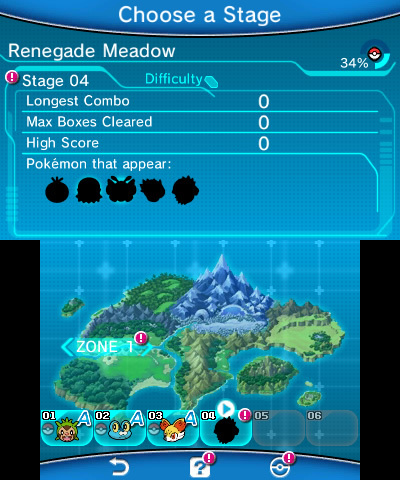 Each zone has many Pokémon that have to be unlocked in battle by meeting certain requirements. The requirements are never stated, which can make unlocking these silhouetted mystery Pokémon frustrating — but that does invite players to go back and play levels again. Players can also unlock additional levels by improving their scores. New zones are also unlocked post-game, like the Infinite Ruins that include Endless Play mode, and the Island of Haste with sped-up gameplay. And, finally, there’s also a Safari Jungle that randomly changes out Pokémon every day. Although it does have less of a plot than the average Pokémon title, with no protagonist and no professors to be found, this doesn’t detract from Trozei as a puzzle title. Players looking for a more immersive experience closer to a traditional Pokémon game may be disappointed, but those who accept that Trozei is a spinoff title and more of a casual gaming experience will likely be able to come to terms with that pretty quickly and enjoy the game for what it is. The graphics of the game reflect its nature- all Pokémon are represented by cutesy headshots, and the details of the environment are simple. Sound effects and music in-game are equally lighthearted and simple; though like the gameplay, it could get repetitive after long stretches of time. I sometimes turned my sound down to avoid listening to the same simple strain of music replay, but I would inevitably turn it back on eventually to see what a new area would sound like. The sounds effects and music both gave the gameplay an adventurous sort of a feel, and they never felt out of place or overdone. 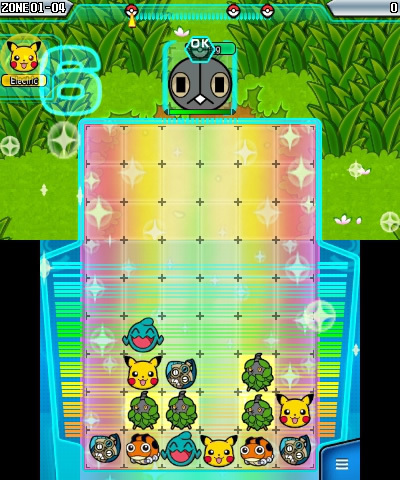 With all of the above taken into account, I think it’s clear by now that Pokémon Battle Trozei is more than your average puzzle matching game. While some players are sure to find the gameplay repetitive and boring over time, same as with any matching game, I found it to be more fast-paced and strategic than I was expecting. More so than idly making matches, Trozei invites players to plan ahead and put a little more effort into clearing the levels. The addictive nature of trying to collect all the Pokémon is another added bonus; and, with 700 Pokémon available, filling your Pokédex is no small feat. I’ve clocked in about 10 hours as of now, which includes my backtracking, playing bonus levels, and checking out the Safari- and I still have a lot left to do. For bursts of casual Pokémon-themed fun, Trozei more than warrants the $7.99 price tag in the Nintendo eShop. NintendoPokémon Battle TrozeiPokemon Link: Battle!